Baffled by the disparity between an advertised image of a food product and the item you are actually served? This is the site for you! How do real pictures of fast food items compare to the advertisements? Hey ho! 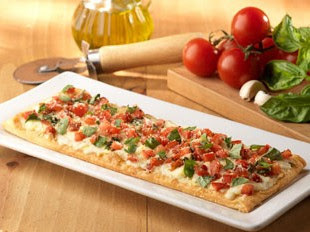 A little crispy and a little lazy on the basil distribution but, overall, a fair Caprese Flatbread from the Olive Garden. This site provides consumers with comparative photos of the advertised images of fast food and restaurant food with those of the product(s) actually served to a customer so that they can critically review them. 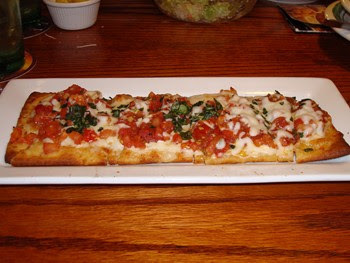 We cover everything from Wendy's hamburgers to Chili's ribs, Arby's sandwiches, and pasta from the Olive Garden. It is said that we first eat with our eyes. Needless to say, that is why so many promotional photos are carefully crafted to elicit a mouthwatering reaction. Ah, but too often, what you really get bares little resemblance to those advertising images (painstakingly choreographed in a photo studio far from any grill or kitchen). What do these comparisons demonstrate?